Home » Reviews » Vinyl » Audiopain/Ne…Split 7"
The last five years or more the tendency to sound "old-school" has given birth to many new bands that just want to sound like they come from the 80s. Now, this is not a bad thing but in the long term "old-school" became mainstream and consequently lost the bonding it had with the original decade. Fortunately, there are still bands out there that sounding old-school is something natural to them. This is exactly the case with the two Norwegian bands that joined forces and release this 7-inch vinyl record with one song in each side. AUDIOPAIN is the definition to the term "old-school" since they present a remarkable non-conformist attitude by refusing to sign a record deal, release a full length album and "socialize" using the nowadays tools like MySpace, FaceBook, Twitter etc. 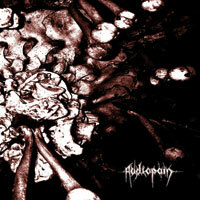 AUDIOPAIN show up in this split 7-inch with "The Memory Of Man". The track starts with some distorted guitar arpeggios and then bursts out into a fast Thrash song to bang your head to. The vocals follow the almost forgotten recipe of harsh timbre with a hearty dose of echo. To some extent AUDIOPAIN reminds me of the prime KREATOR days revealing the strong influence from the German school of Thrash. Behind the microphone we also find AURA NOIR's Apollyon who adds an evil layer in the excellent track. The neck-snapping break somewhere in the middle will remind the old and will teach the new what "old school" really means! Next stop on this vinyl gem is "Annihilation Spree" by NEKROMANTHEON. This is another Norse trio that likes to dig out all the Thrash 80s virtues. But this is not the only thing to mention here; the band adds two significant influences in this track from the "Haunting The Chapel" SLAYER days and from the legendary first two VENOM albums. I mean the rhythm section literally is bone crushing with a killer bass guitar sound that tops everything off. The trademark tempo break with the classic drum pattern is simply amazing while the Cronos-sounding screaming are the icing on the cake. There is nothing to be added here! This vinyl is one of those cases where die-hard record collectors will be killing to obtain 10 years from now in the future. So, act fast and order yourself a copy since there are only 1000 copies out there!